In the early part of this century there were some 400 Muslims from Indian sub-continent working in the Hong Kong Prisons Department. In the beginning their Headquarters were in Arbuthnot Road/Victoria Prison area which is quite close to Shelly Street where there existed a Mosque where they could pray. However, in the 1930’s some of them were moved to Stanley where a new prison complex was constructed. Although at that time there existed places of worship including churches & temples for believers of other religious faiths but no Mosque was present for the Muslims to offer their daily prayers. The Muslims made a request to the Prison authorities who provided a piece of land where they started offering their daily prayers. Later a Mosque was built at the same place which opened on January 1, 1937. Stanley Mosque is a result of the dedication and hard work of the Muslims who not only made financial contributions towards the construction of the Mosque but also assisted the construction workers in their off duty hours. Their untiring efforts reflect their loyalty to Allah Almighty. The Mosque is located at 53 Tung Tau Wan Road inside the restricted area at Stanley Prison. It is a beautiful little Mosque with a fairly large prayer hall, has a veranda and a courtyard. The Correctional Services Department of HKSAR kindly permits the use of the Mosque especially on Fridays or other special occasions by Muslims other than its own staff. 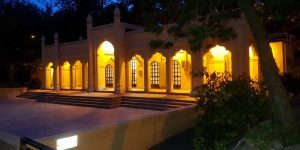 The Advisory Board of Antiques & Monuments Office designated Stanley Mosque as a Grade 1 historic building on 18 December 2009.